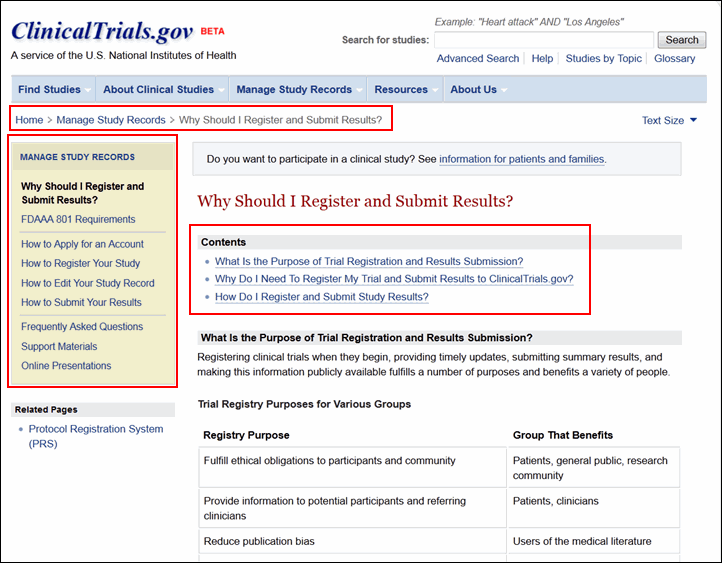 On August 13, 2012, visitors to the ClinicalTrials.gov Web site and the accompanying Protocol Registration System (PRS) Information Web site (designed for data providers) saw a link to a beta site including a new integrated homepage and updated graphic design for the site (//clinicaltrials.gov/beta/). 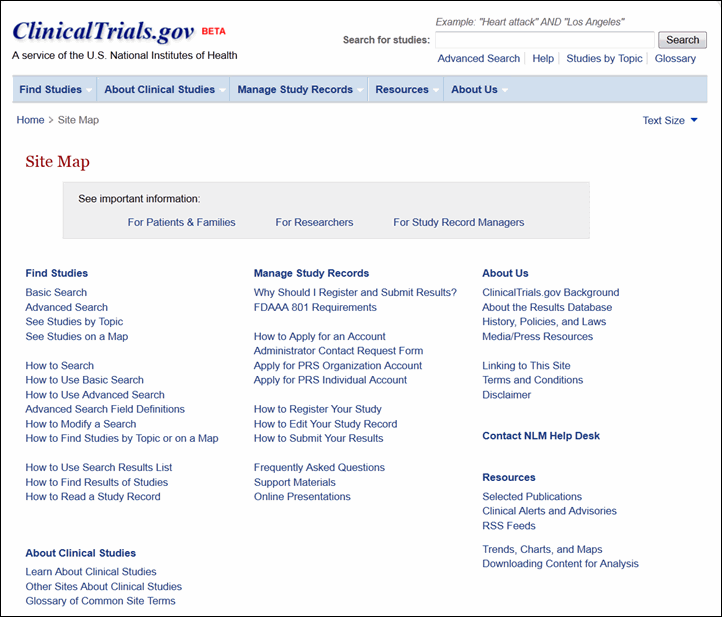 (The last major redesign of ClinicalTrials.gov was introduced in September 2007. 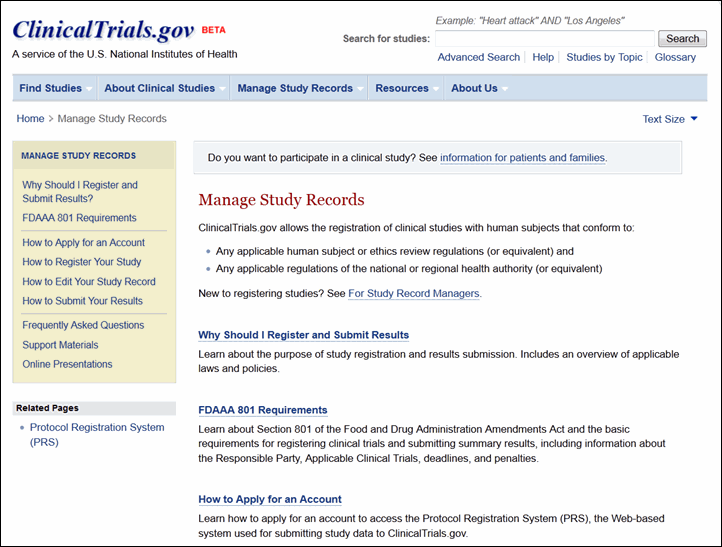 For more information, see New Look for ClinicalTrials.gov.) Visitors will also have access to new and reorganized written content about clinical research, background information about the site, searching for studies, and maintaining study records. However, core functions of the site  including the basic and advanced search, search results options, and the study record data – will remain the same. The new site interface will run in parallel with the previous version for approximately four weeks after launch. After appropriate testing and additional minor changes it will permanently replace the previous interface. 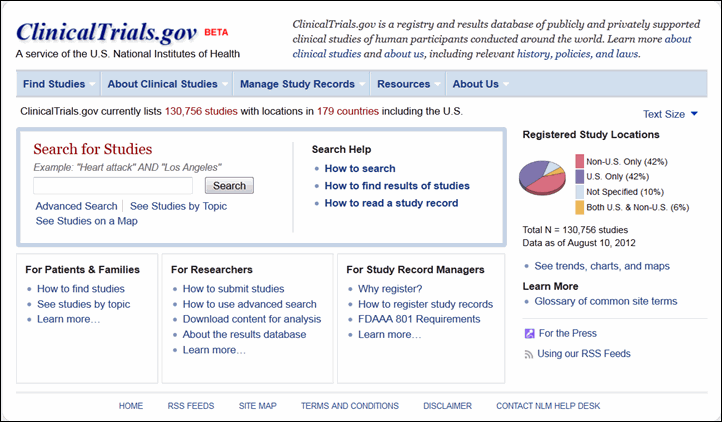 The homepage (see Figure 1) showcases the study search options and search help resources in one location, the "Search for Studies" area. Site visitors can begin a basic search here, go to the advanced search form, or begin browsing for studies by topic or on a world map. 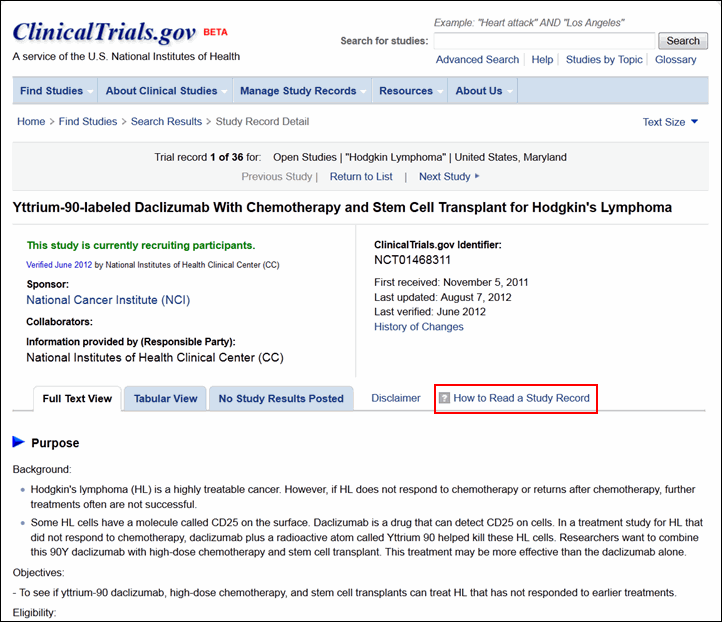 Site visitors can also get help with searching, finding studies with summary results posted on ClinicalTrials.gov, and reading study records. A new menu bar provides direct access to each area of content on the site (See Navigating the Site). Custom views of this content have been created for different user groups. Patients and families, researchers, and study record managers are three significant groups that visit ClinicalTrials.gov. The homepage areas for these audiences provide an introduction to content for each user group, and the "Learn more" link in each area goes to an orientation page that highlights relevant resources on the site. For example, study record managers can find out which clinical trials should be registered with ClinicalTrials.gov and get help with setting up accounts, registering studies and updating records. Members of the press also have a new page with background information and statistics about the site (see the "Media/Press Resources" page under "About Us" in the menu bar). Data about the site are highlighted in the right column of the homepage. Users can access "Trends, charts, and maps" content for more statistics. An enhanced Glossary provides descriptions of clinical research terms commonly used on ClinicalTrials.gov and "Using our RSS Feeds" explains how to get notification of new and updated study records. Figure 1: New ClinicalTrials.gov homepage. Site visitors can conduct a basic search for studies using the Search for Studies area on the homepage (see Figure 1) or using the search box in the header of any other page (for example, see Figure 2). Both locations have a link to the advanced search form. Users can now limit a search by specific recruitment statuses (for example, "Recruiting," "Active, not recruiting") in addition to the overall categories "open studies" and "closed studies." The search results page has a new look but uses the same method to retrieve and list study records based on your search terms (see Figure 2). The "How to Use Search Results List" link at the top of the page provides detailed help information. Figure 2: A search results list with highlighted features. The search results page will continue to display Condition and Intervention as the default fields under each study title in the list. More display options are available from the "+Show display options" link at the top of the search results page (see Figure 2). These options have been organized into four groups for easier selection: Study Details, Participant Details, Identifiers, and Dates (see Figure 3). Figure 3: The search results list display options. Although the content remains the same, each study record has a new look (see Figure 4). Study sponsor and collaborator information plus prominent dates regarding the history of the study record are summarized at the top of the page. Below, the layout of the full text view, tabular view and study results tabs remain the same. Related studies information is no longer displayed for study records. The "How to Read a Study Record" link provides detailed help information. Figure 4: Full text view of a study record. Site visitors can use the new menu bar from any page on the site to access five areas of content on the site (see Figure 5), each of which includes multiple pages of information. These pages are summarized in the Site Map link available in the footer area of any page (see Figure 6). Figure 5: New content navigation options. Figure 6: Site Map  overview of content areas and pages. Other new navigation tools include "bread crumbs," just below the menu bar on each page, menus in the left column, and a "Contents" section at the top of each content page (see Figure 7). Figure 7: Other navigation tools. The About Clinical Studies section provides a brief overview of clinical research, information for potential clinical study participants, and an enhanced glossary of common words used on ClinicalTrials.gov (see Figure 8). Site visitors can also find links to other government Web sites providing information on clinical studies and other related health care issues. Figure 8: Enhanced glossary of common site terms. Figure 9: Manage Study Records overview page. 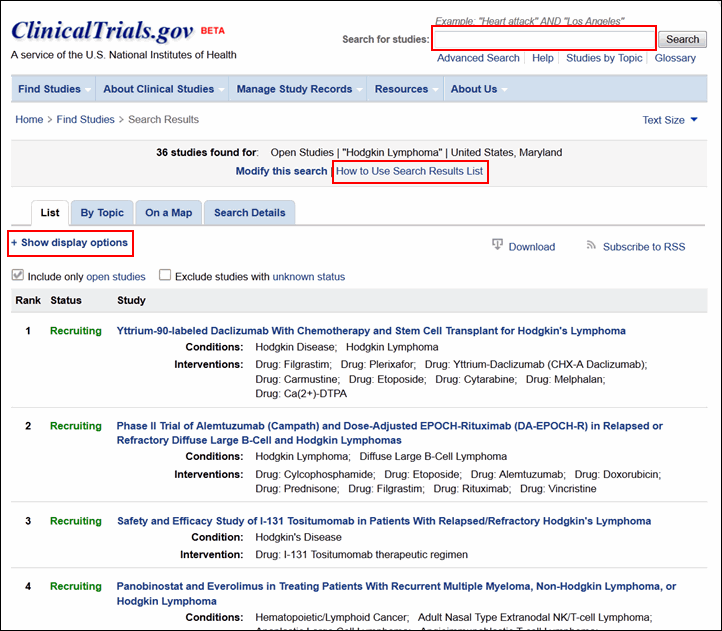 The Resources section includes links to selected outreach and scholarly publications related to ClinicalTrials.gov and clinical research. Visitors can find links to clinical alerts and advisories issued by NIH and information on subscribing to RSS feeds for new and updated clinical studies. This section also includes statistics about ClinicalTrials.gov including the locations of studies, types of registered studies, and number of registered studies over time. Advanced users can get information on retrieving study record data and search results in Extensible Markup Language (XML) format for analysis. The About Us section provides information on the purpose, history, and development of ClinicalTrials.gov. Visitors can learn about related events, policies, and laws that influenced the site's creation and expansion, including the implementation of a results database in September 2008. A summary page specifically for members of the press provides background information and statistics about the site. This section also includes policies regarding linking to ClinicalTrials.gov Web pages and using Web crawlers to access the study records on the site. Terms and conditions cover the availability and the appropriate use of information on the site. We welcome your comments and questions. Please click on "Contact NLM Help Desk" in the footer of each page to contact us.